In Sweden crayfish season is in full swing, and I wanted to remind you all that one of the most important things for a crayfish party (apart from the crayfish and snaps) is this Västerbotten cheese quiche. You can buy the cheese from Ocado (love their Swedish shop!) but you could also substitute it for a sharp cheddar if you prefer. 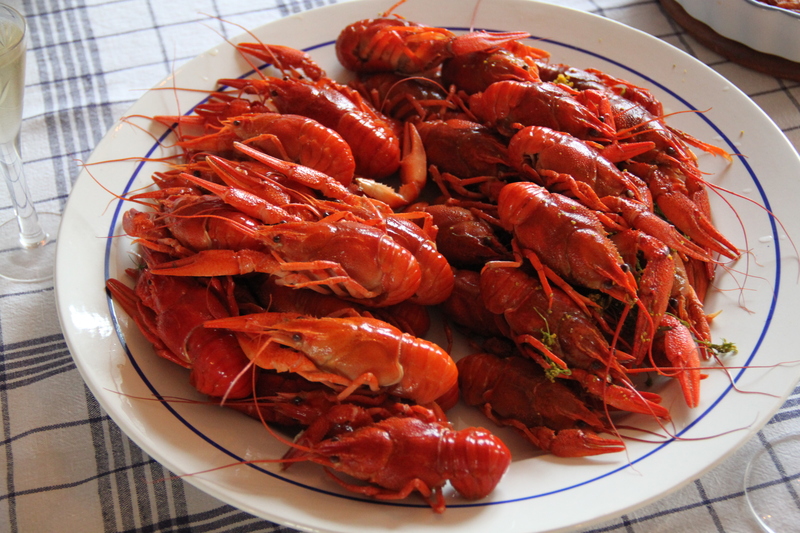 We had a little crayfish party when I was home in Sweden and I love this non-holiday more than some actual holidays. The crayfish are just delicious, but we went all out with both fresh and smoked prawns (they’re delicious!) as well. 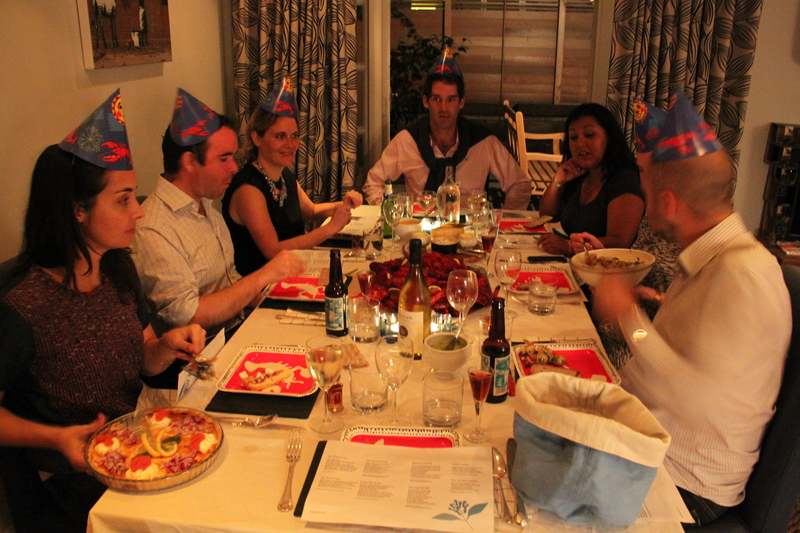 And yes, we had snaps (Linie Aquavit, pictured above) and silly hats. Bread and cheese is also needed to soak up the alcohol (snaps is strong!) and maybe some homemade mayonnaise for dipping. And don’t forget the finger bowls – this is a very messy (but really fun!) affair! Mix the ingredients together for the dough and press it out in a quiche dish. Use a fork to pierce the dough all over. Pre-bake the dough for 10 mins at 175 C.
Mix the grated cheese with the cream, eggs and yolks and pour the mixture into the pastry case and bake for another 20 mins. Fry the girolles in butter on medium-high heat until almost done. Add the shallots and garlic and fry until golden. Season well and add the parsley. Place on top of the quiche just before serving. The last few years I have made sure to invite my London friends to a proper Swedish crayfish party, as it’s my favourite non-holiday holiday in my native country. I usually buy the pre-cooked frozen crayfish from the Swedish shop but last year I actually found a crayfish seller who sold fresh crayfish caught in local lakes or ponds. The price was almost the same, and the quality so much better, but I also really wanted to cook my own crayfish! Compared to lobsters who you usually cook in boiling water, we cook crayfish in a sort of brine that we then leave the crayfish in until we eat them, adding a salty dilly taste to the crustaceans. My London friends love crayfish as much as I do, so I ordered 7 kg for 12 of us, which may sound like a lot, but we ate every single one. It was a little tricky cooking that many with not that many large pans to hand but I managed*, and had a good time in the process experimenting with two types of brine; one with just salt, sugar and dill and one with beer in (a common practice for cooking crayfish) that add more depth to the flavour. Make sure all the crayfish are alive, discard any dead ones. Rinse in cold water. Bring water, salt, sugar and dill flowers to the boil. Put the crayfish in a colander and lower it into the boiling brine to cook the crayfish. Cook for 10 minutes, from the brine starts boiling again. Leave to cool in the brine, keep cold and eat within 24 hours. Make sure all the crayfish are alive, discard any dead ones. Rinse in cold water. Bring water, beer, salt, sugar and dill flowers to the boil. Put the crayfish in a colander and lower it into the boiling brine to cook the crayfish. Cook for 10 minutes, from the brine starts boiling again. Leave to cool in the brine, keep cold and eat within 24 hours. The second nibble we had with the pre-crayfish prosecco was these lovely puff pastry squares with fried girolles and Swedish Västerbotten cheese (any other sharp cheese will do, but Västerbotten is a must with crayfish). I’m so pleased I can now by girolles with my food orders from a decent supermarket I come up with any excuse to buy them and this is a good way to use them. But to make them go a bit further (as they’re not the cheapest of shrooms) I threw in some chestnut mushrooms as well. Pre-heat oven to 200C. 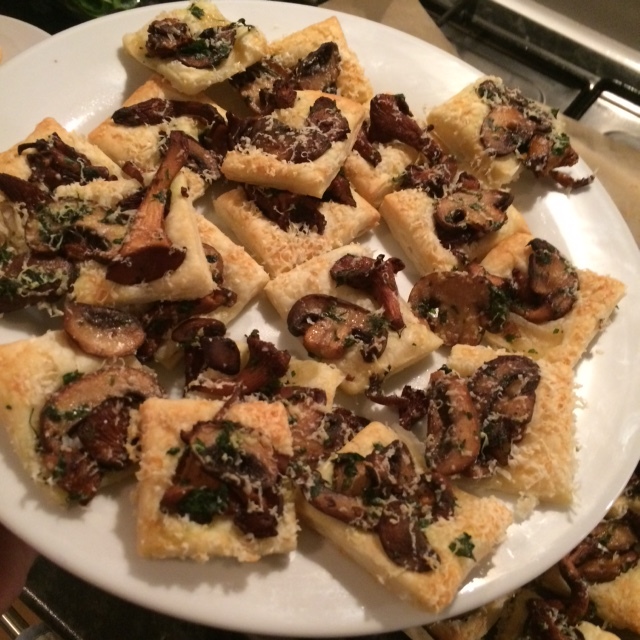 Roll out the puff onto a parchment paper covered baking tray and cut into squares. Clean the mushrooms and slice. Melt the butter in a frying pan on medium heat and fry the mushrooms until golden in batches. Add the garlic towards the end. Add salt, pepper and parsley. Leave to cool. Distribute the mushrooms on the puff. Scatter grated Västerbotten cheese on top and bake until golden. Serve immediately. As I’m hosting a crayfish party tonight I thought I’d share these pictures from my last crayfish dinner in Sweden. I managed to eat crayfish twice in the two and a bit weeks I was at home, and lots of other lovely seafood too, but I am just as excited about tonight’s festivities with my London friends. But back to the crayfish party in Sweden. 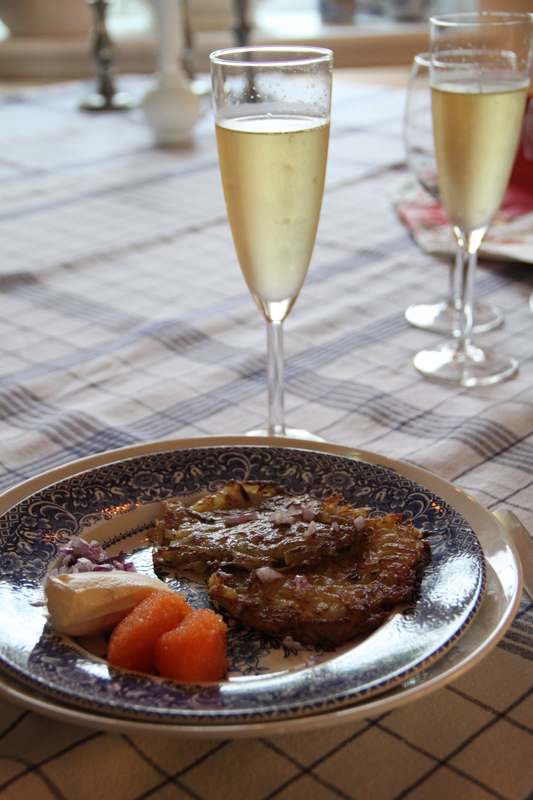 It was just a family affair so we started with rösti, Kalix roe (bleak roe from Kalix), creme fraiche and chopped red onions. This is such a Swedish classic it’s almost a cliché but I absolutely love it (as do most Swedes!). We had two types of crayfish, both fresh, Swedish and Turkish. They were both nice but the Swedish ones were the nicest. We also had a typical Västerbotten cheese quiche (here with fried girolles on top) which is a must with the crayfish, bread, cheese and of course snaps. 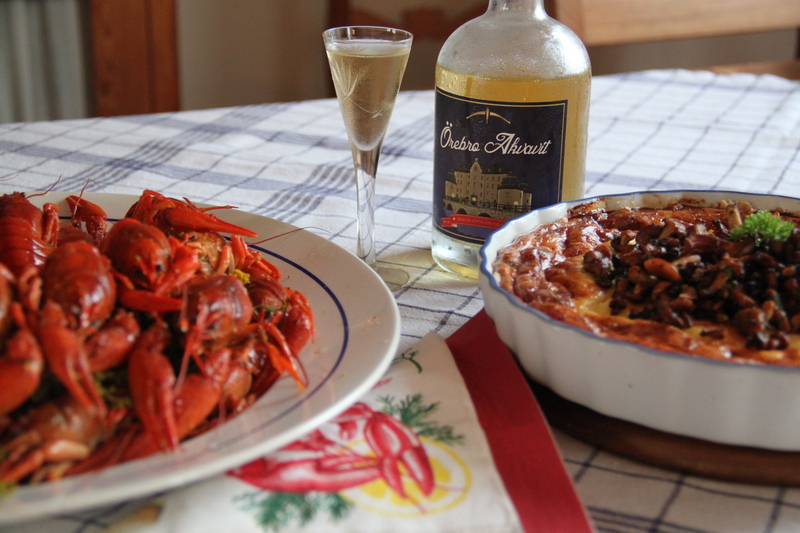 Crayfish party or not – have a nice weekend! A few weels ago my flatmate Daisy and I decided to host a proper Swedish crayfish party. And I’m so glad we did because it turned out really well! We were an eclectic mix of nationalities but everyone was super psyched up about eating crayfish and drinking snaps. Thanks guys! It was a Friday night and when we waited for everyone to arrive we sat outside as it was a mild evening and had some Prosecco and some Pimm’s with elderflower and blackberries (with lemonade and club soda) and had a few nibbles. 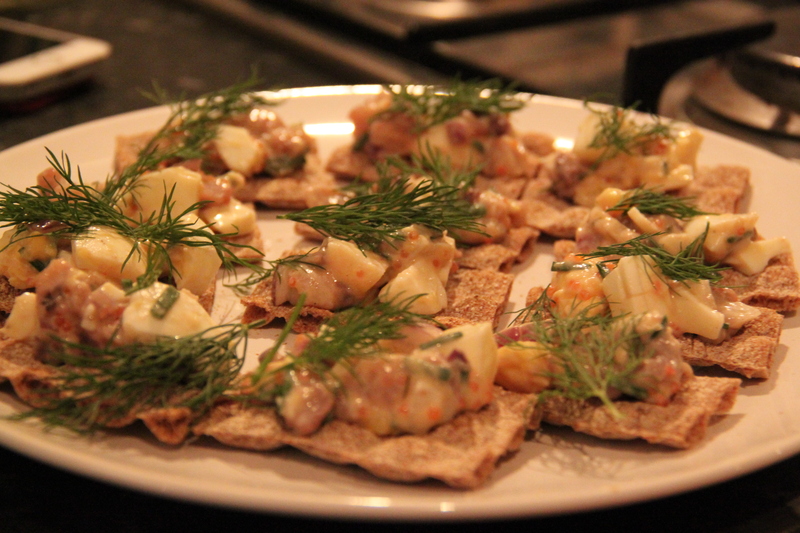 One was Swedish crispbread topped with a herring and egg salad. Very Scandi and for those not fancying herring we also had crostini with tapenade. As you can see we had proper crayfish knives and crayfish hats! With the mountain of crayfish (at the middle of the table) we had a Västerbotten cheese quiche which is a must at every crayfish party. (Thanks Ocado for having that and lots of other goodies in your Swedish shop!) 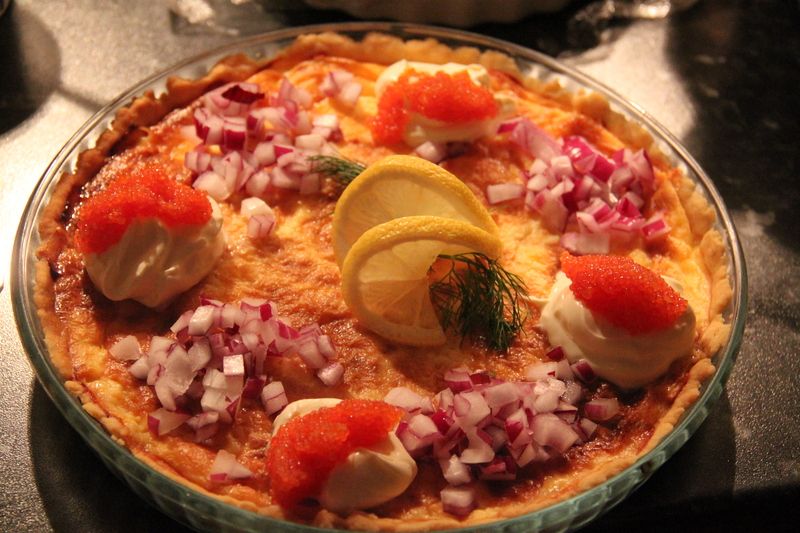 The quiche was decorated with lumpfish roe, creme fraiche, chopped red onions and dill. We also had bread, cheese, cream cheese with caraway, honey and dill, wild garlic mayo, saffron mayo and new potato and girolles salad and a regular green salad with radishes and avocado. 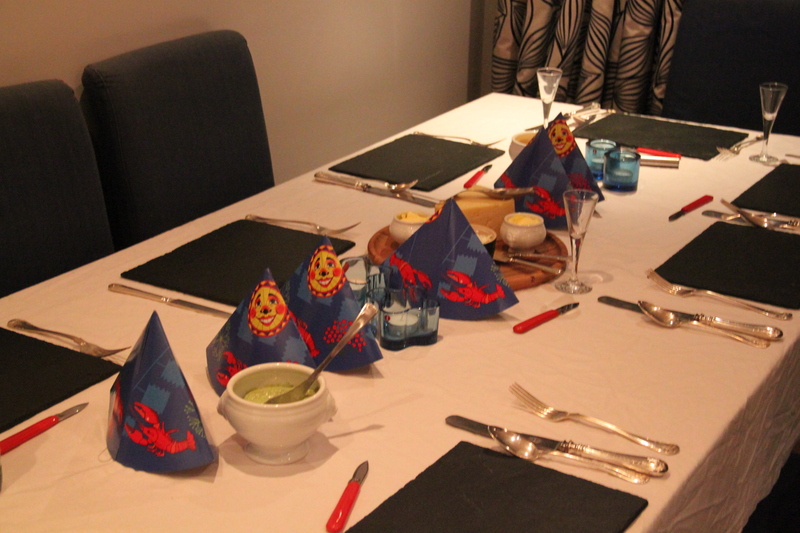 It was such a fun evening complete with crayfish peeling tutorials form the Swedes, snaps songs and lots of laughter. We also had pudding very late at night but it was so good I think it deserves its own post. Mix all the ingredients, season to taste with salt and white pepper. Break up the crispbread and place a dollop of the herring mixture on each piece. Decorate with dill. Mix saffron with warm water. Add half of the saffron water to the egg yolk and mix a little before starting mixing in the oil, drip by drip at first and then in a gentle pour while using a stick blender. Season with lemon juice, add the remaining saffron water and season with salt and pepper. Leave for half an hour before serving (for the flavours to develop). Fry the girolles and pressed garlic in butter. Season. Put the onion slices in a bowl and cover with cold water for 5 minutes. Drain. Add the onions and girolles to the potatoes. Add a nice olive oil and some sherry vinegar, salt and pepper. Season to taste. Add chopped parsley and serve. Last Friday a few of my girl friends came over for dinner and while waiting for everyone to arrive we had some bubbly, this sparkling wine from Loire, and crisps. When most people had arrived I brought out two types of crostini, still casually sitting on the sofas. One of the toppings were suppose to be the same as on Toast Öjeby, a mixture of crayfish, sharp cheese, dill, cumin and honey, but as Waitrose and Sainsbury’s both failed to deliver crayfish, I made the same mixture with coldwater prawns instead. And parsley instead of dill as I hadn’t bought enough (yep, it was one of those weeks). Substituting the crayfish with prawns worked well flavour wise but it didn’t look as pretty. As one of my friends is not that keen on shellfish I also served a bunch of crostini topped with homemade gravadlax (cured salmon) and dill cream cheese. Start 48 hours before serving. Remove the skin from the salmon. Mix sugar, salt and dill and pat it onto the fish. Place in a small dish and cover with cling. Refrigerate for 48 hours. Before serving, make the crostini by slicing the baguette thinly, placing the slices on parchment paper on a baking tray. 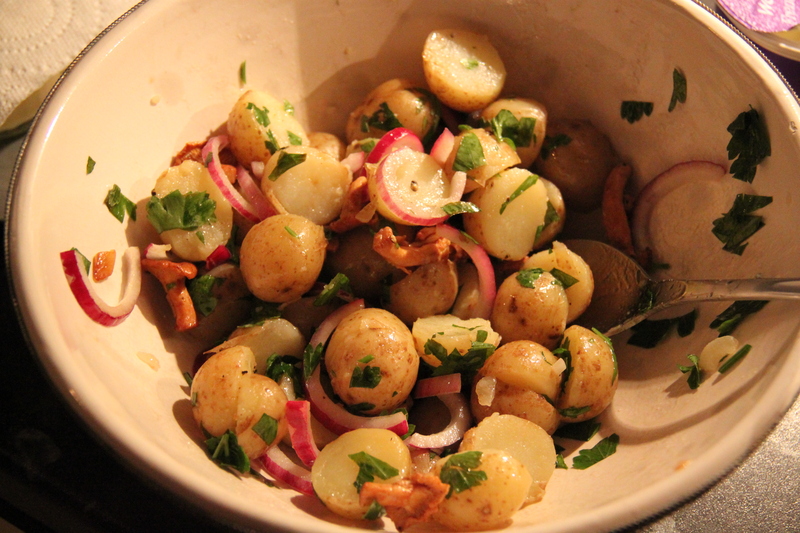 Drizzle with olive oil and bake in 200C oven until crisp and golden, approx 10-15 minutes. Leave to cool. Pat the salmon dry with kitchen towel and slice thinly. Mix cream cheese with dill, honey and mustard. Season. 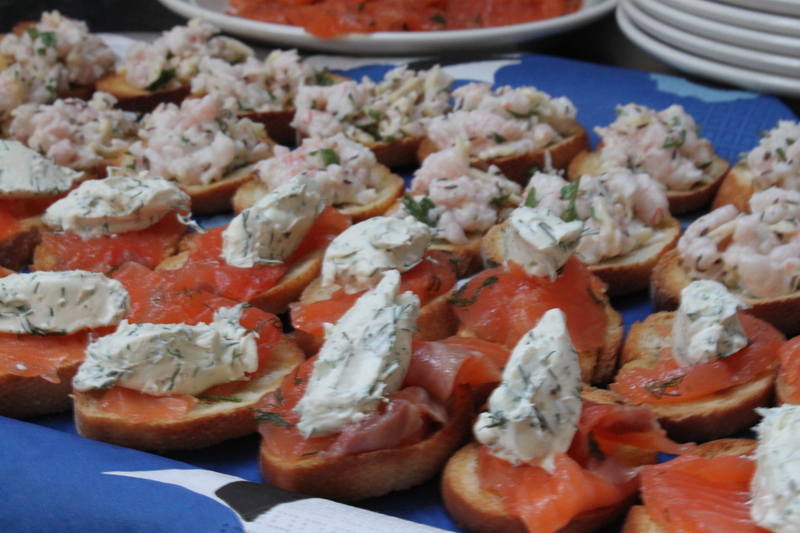 Divide the salmon slices on the crostini, place a teaspoon sized dollop of dilly cream cheese on top, season and serve.